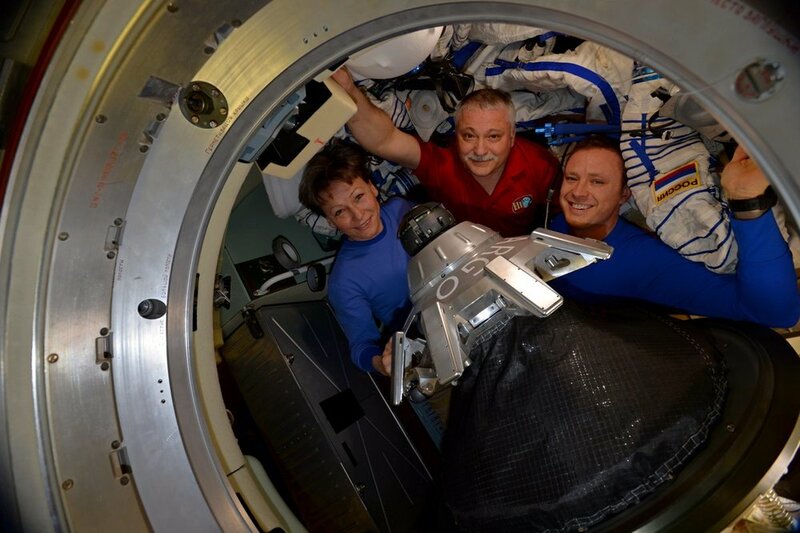 Returning were NASA astronauts Peggy Whitson and Jack Fischer, as well as Russian cosmonaut Fyodor Yurchikhin. The latter two have been in space since April 2017, while Whitson has been living aboard the outpost since November 2016 – nearly 10 months. Their journey back to Earth began at 2:41 p.m. EDT (18:41 GMT) Sept. 2, 2017, when the hatches between the spacecraft and space station were closed. Several hours later, at 5:58 p.m. EDT (21:58 GMT), Soyuz MS-04 undocked from the ISS. When the spacecraft was about 20 meters from the outpost, its thrusters fired to push the spacecraft away faster. Then, some 90 seconds later, a second departure burn was performed to push the vehicle out of the station’s 200-meter Keep-Out Sphere. The two vehicles continued to separate over the next several hours until they were several miles apart and the Soyuz’ orbit was in line with the landing zone. Then the spacecraft pointed its main SKD engine in the direction of travel to perform a 4-minute, 39-second deorbit burn. This occurred at about 8:29 p.m. EDT (00:29 GMT Sept. 3) to slow the vehicle down by about 128 meters per second. Several minutes before making contact with Earth’s upper atmosphere, the three modules of the Soyuz – the Orbital Module, the Descent Module, and the Service Module – separated. Only the Descent Module with the crew is designed to survive re-entry. The Soyuz began skirting the atmosphere at nearly 8 kilometers per second just before 9 p.m. EDT (01:00 GMT) while at an altitude of about 100 kilometers. About seven minutes later, the capsule slowed down to about 2.2 kilometers per second. At this point, the crew was experiencing their maximum gravity load of about 4.5 times the force of Earth’s gravity. About one second before touchdown, the Soft Landing engines ignited in a momentary burst to cushion the final three feet (about one meter) of the crew’s journey home. Each was carried to lawn chair-like couches, given water, and allowed to call family members. Soon after, the trio were carried into a nearby medical tent for a multi-hour post-landing evaluation. Next, they will be flown to nearby Karaganda, Kazakhstan, where Whitson and Fischer will part ways with Yurchikhin. The former two will travel back to Houston by way of Cologne, Germany, while the latter will travel to Moscow. Yurchikhin completed his fifth mission, bringing his on-orbit duration total to 673 days – seventh on the all-time space endurance list. Additionally, he has completed nine spacewalks over his career, bringing his total to 59 hours, 28 minutes. Fischer completed his fifth mission. During his 136-days in space, he ventured outside the outpost on two spacewalks for a total EVA time of 6 hours, 54 minutes. Whitson’s 288-day mission brings her cumulative total to 665 days over three missions – eighth on the all-time space endurance list and more than any other American. Over her career, she has performed 10 spacewalks lasting a total of 60 hours, 21 minutes – third on the list of cumulative spacewalk time. Whitson launched into orbit in Soyuz MS-03. Because Russia decided to reduce its regular crew size from three to two, Soyuz MS-04 only launched with Yurchikhin and Fischer. As such, Whitson was granted a three-month mission extension and was able to use the empty seat for the return journey home. Remaining aboard the ISS as Expedition 53 are NASA astronaut Randy Bresnik, Russian cosmonaut Sergey Ryazanskiy, and European Space Agency astronaut Paolo Nespoli. They launched to the outpost on July 28 in Soyuz MS-05 and will land in December 2017. In just 10 days, three more people will launch to the space station. On Sept. 13, 2017, Soyuz MS-06 will send Russian cosmonaut Alexander Misurkin and NASA astronauts Mark Vande Hei and Joe Acaba on a six-hour trek to rendezvous and dock with the outpost. They will remain there until February 2018.